Ryan Ross is originally from New York and moved to the Sunshine State in 2008, earning his music education degree from Florida Atlantic University. Mr. Ross is also finishing his Master’s degree from University of Florida in Music Education. Mr. Ross is the current band director of Jupiter High School and was the former Band Director at L.C. Swain Middle School in Palm Beach County. During his time at L.C. Swain, he was able to resurrect a previously stagnant program, starting with 12 kids in the band program. They didn’t have instruments, they didn’t have a music library and had 200+ signed up for band by his departure. Prior to Mr. Ross, L.C. Swain had not performed at MPA for 9 years and under Mr. Ross’ leadership, L.C. Swain was able to attain straight superior ratings for the first time in school history. Mr. Ross previously served as the co-director and music caption head for STRYKE Percussion 2 earning a gold medal and fan favorite award their first year out in competition. During the time since, he has worked at programs including FMBC and BOA finalists like Coral Glades High School and Stoneman Douglas. He has also marched with the WGI world class percussion ensemble STRYKE Percussion, gaining two open class silver medals, and he was a part of the promotion to World Class. Mr. Ross has a record of growing music programs and inspiring students. Mr. Ross is constantly seeking professional growth and development and attends workshops regularly to enhance his music practice and to stay current on the latest pedagogy. 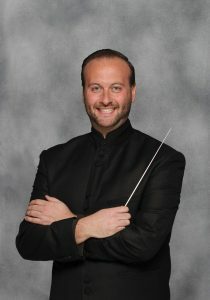 He has attended conducting symposiums and has had the opportunity had the opportunity to work with renowned conductors such as Dr. Scott Lubaroff, Dr. Donald J. Mckinney, and Mr. Steve Rivero.